We present a fully automatic technique which converts an inconsistent input mesh into an output mesh that is guaranteed to be a clean and consistent mesh representing the closed manifold surface of a solid object. 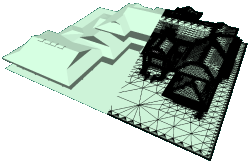 The algorithm removes all typical mesh artifacts such as degenerate triangles, incompatible face orientation, non-manifold vertices and edges, overlapping and penetrating polygons, internal redundant geometry as well as gaps and holes up to a user-defined maximum size. Moreover, the output mesh always stays within a prescribed tolerance to the input mesh. Due to the effective use of a hierarchical octree data structure, the algorithm achieves high voxel resolution (up to 4096^3 on a 2GB PC) and processing times of just a few minutes for moderately complex objects. We demonstrate our technique on various architectural CAD models to show its robustness and reliability.